We understand that loading tanker and hopper trucks can be challenging because they come in a variety sizes, and configurations necessitating versatile offloading solutions. SafeRack truck access gangways are engineered to articulate and self-level, adjusting to varying vehicle heights. Leveraging a unique spring counterbalance system allows our gangways to be repositioned with minimal effort. 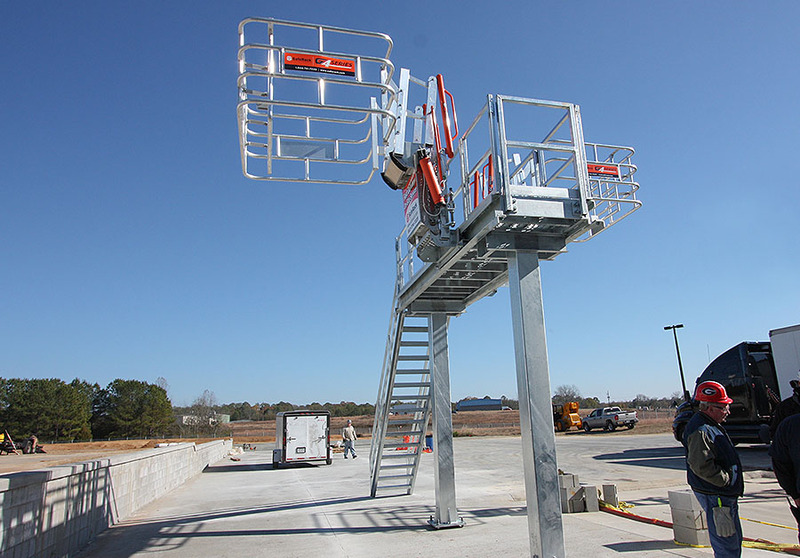 With optional features like the offset safety cage, and the SafeLok gangway safety lockdown system, SafeRack offers a wide variety of innovative solutions to help your truck loading facility safer and more efficient than ever before. SafeRack’s SAS gangways are more ergonomic and last longer. Tested in the most critical applications, these gangways outperform all others. In addition to multiple lengths, the SAS is available in 24″, 36″, 48″, 60″ and 72″ widths. Adding fall protection cages is easy, and customized designs are available to meet difficult applications. The SFR is a flat ramp gangway with a simple design that’s ideally suited for hopper car applications. It works particularly well when the platform height and the vehicle height are equal to each other. The SFR has a slip-resistant walk surface and comes standard with a hot-dipped, galvanized-steel base tread. Popular for railcar applications, our FRT access gangways extend to increase safety and access. With rugged, oversized parts the access gangways are built to stand up to years of abuse. And they feature counterbalanced, adjustable springs that help raise and lower the units with minimal effort. 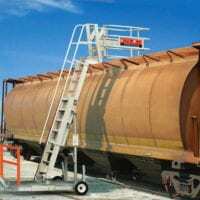 SafeLok is a one-of-a-kind safety device that prevents operators from bypassing the truck loading gangway safety system. 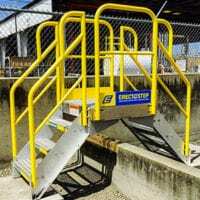 The innovative mechanism keeps gangways securely locked in the down position until an operator returns to the main loading platform where the lock can then be released to raise the gangway. This unique solution prevents the gangway from being moved until workers are safely out of the work area. Cement cage for off-set hatches and Gangway with Saf-Lok installed. Our advanced corrosion-resistant aluminum gangway is designed for OHSA compliant worker safety.